I was pretty excited about the OWLE iPhone Camera Accessory when I first saw it. It is a case that your iPhone fits into that gives you a boom microphone and an adapter for 37mm lenses. It comes with a standard and macro lens. I have to admit that I am feeling the limitations of the iPhone camera and sometimes I miss my Panasonic Lumix. The problem with the OWLE is that it’s just as bulky as carrying around a “real” camera. If I have to carry around some bulky thing, I might as well just carry around my Lumix. It has a wide angle Carl Zeiss lens and optical image stabilization. The iPhone camera is the best camera available, which means that it’s the camera that I have when I’m not planning on filming or taking photos. Unfortunately, the current iPhone camera will never be good enough for serious photographers and videographers. No amount of added lenses and mounts will change that. Sorry, OWLE, you’re cool, but if I have to carry around something that bulky, I’m going to be packing some REAL heat. The brilliant Andrew McDonald has provided this Pictorial Guide to avoiding Camera Loss! â€˜How can I prevent Camera Loss?â€™ I hear you ask, wishing Iâ€™d get to the point. Well, you canâ€™t prevent cameras from getting lost, but you can do something so your camera can be found very soon after it has vanished. All you have to do is take some photos â€“ which you never delete from your camera â€“ so when someone finds your camera at the bottom of the gorilla pit they are able to locate you and return the lost property to its rightful owner. After reading through the photos and laughing with him, I would definitely try to contact him to return his camera. The wonderful Liz Revision made this purse out of an old and broken Dance Dance Revolution Dance Pad. She used a pattern to create the purse and even included a lining. Excellent work, Liz! While shopping at a used bookstore, I found this little instruction manual for a Kodak Pocket Camera. It is for a hundred year old camera, but some of the advice is good even today. I love their simple definitions for things like Depth of Focus and f-Stops. This photograph showing the proper way to hold the camera is wonderful! These old Kodak cameras had a feature that I wish modern day cameras had. It was called the Autographic Feature and allowed you to document notes about the photograph when you took it. The advice on how to take photographs is still good even today. I love this description of why it’s important to keep your lens clean. All of us need to remember this simple tip when we pull our camera phones out of our lint infested pockets for a quick shot. If you don’t own a camera like this, it’s sure fun to see how far photography has progressed in the last century and how the definition of “pocket” has changed over the years. While Mike and I were out Christmas shopping, we came across an Etch A Sketch Free Style and a flood of memories came back to me. I had never owned an Etch a Sketch when I was a kid, but I did get a Skedoodle one year. The Etch A Sketch Free Style reminded me of my old Skedoodle. 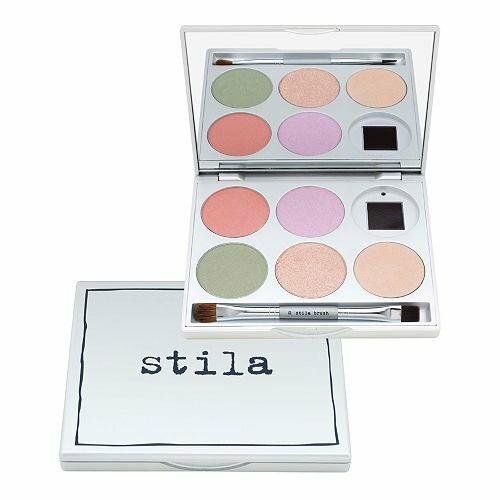 Instead of two knobs, like the traditional Etch a Sketch, the Etch A Sketch Free Style has a joystick control that allows you to move the stylus on the screen in two dimensions. The Skedoodle had the same kind of control and I LOVED that thing. It was a strange hybrid between a Etch a Sketch and a Spirograph. I found it in the 1979 Sears Wish Book. Its description makes it sound like more fun than my ten year old brain could handle. Move the control stick, you can draw lines, curves, circles – even write your name on the Golden View Screen. To erase, flip over and shake. It had inserts that you could put into the joystick area that would help you make Spirograph-like designs. Just like the Spirograph, I was never really able to make a beautiful design like I was supposed to, but that never stopped me from enjoying that toy to its fullest. 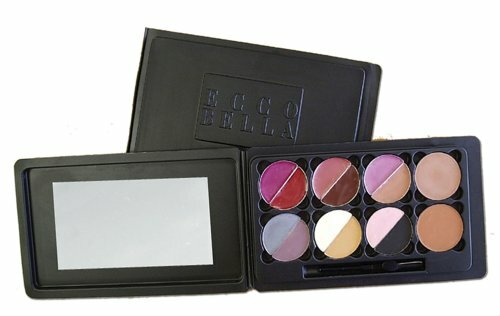 Unlike the Etch a Sketch Free Style, the screen of the Skedoodle was domed and golden in color. Here it is in its full glory. You can’t tell from the photo, but the way you would make Spirograph-like pictures is you would run the joystick along the edges of the plastic insert. It would create a shape on the screen (as shown). Then, you were supposed to turn the screen itself by grabbing a hold of the black dial on the front. This may have been an easy feat for the adults who designed this toy, but my small hands just couldn’t turn that dial without accidentally erasing the picture. After all the times I tried to make a design, I got maybe three or four shapes done before accidentally erasing the screen. It was VERY frustrating. Now that I’m an adult and have full-sized hands, I probably could make a design within minutes. My Skedoodle died a sad and miserable death. One summer day, I sat on a lawn chair and systematically ran the stylus over EVERY inch of the screen without erasing. I wanted to see what was inside the Skedoodle and if I cleared the screen, I would be able to see it. My obsessive behavior paid off and I was able to see the mechanism in the toy and how it was connected to the joystick. Unfortunately, it never recovered. No matter how much I shook up that poor Skedoodle, the screen never returned to its golden beauty. I could ALWAYS see that mechanism inside. I’m trying my best not to buy an Etch A Sketch Free Style. I SO want to systematically run the stylus over every inch of the screen to compare its innards with my memory of the Skedoodle innards. When you print them up on transparency film, you can have a bunch of fun puzzles for your toy. That’s one thing that Skedoodle never had. When I lost those little plastic inserts, they were GONE with no hope of replacement. Of course, by then, I had already demolished the golden screen with my curiosity and obsessive thoroughness. In the end, the Etch A Sketch Free Style is an interesting update to both the Etch a Sketch and the Skedoodle. Seeing it in the store brought back a flood of memories and it was a struggle to not immediately buy it on impulse. Last weekend, I went to visit my mom. In the bathroom, I saw a clock that has been part of the house since the Eighties and it looked it. We bought this clock for Carol when her eyes started failing. When you press the button on the top, the clock announces the time. Here is a video of it in action. I’ve seen this clock in my parents’ house for two decades, but something about the retro Max Headroom style made it jump out at me. It suddenly looked out of place in their house. All the Eighties stuff that used to be in their house has slowly gone away, leaving this last vestige. The talking clock was spared because of its functionality. We should all be so lucky. So lifelike you feel like you’re right there with 3 dimension pictures! It’s a camera and viewer that takes 3D photos and then lets you see them in a viewer similar to a Viewmaster. Some of them are still around today. 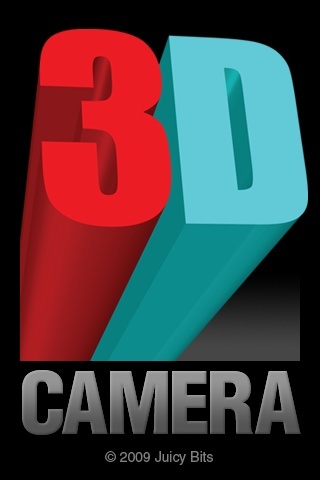 Fortunately, if you own an iPhone, you can do this with an inexpensive app called 3D Camera [iTunes Link]. 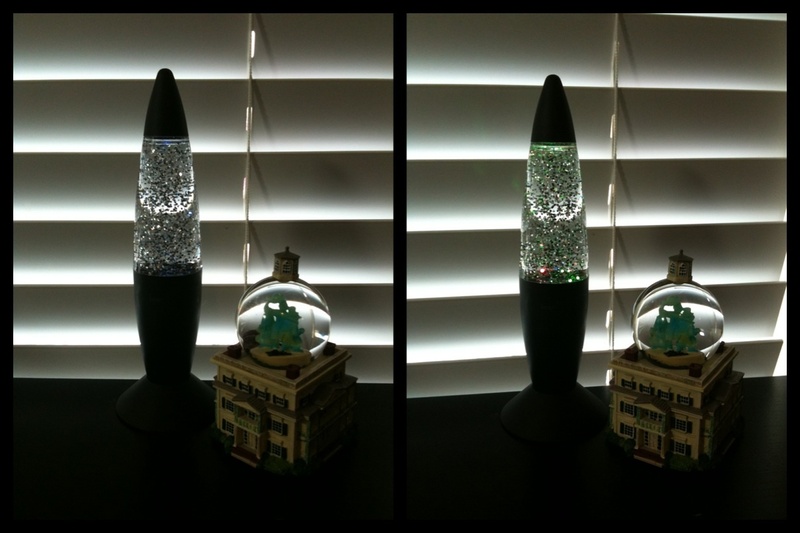 It’s easiest to do these 3D photos on inanimate objects like this tiny lava lamp and snow globe. 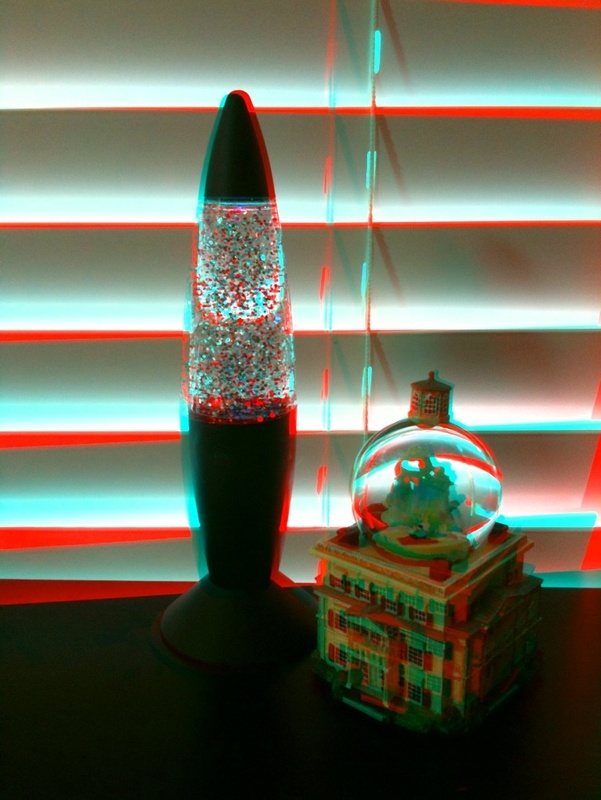 Since I have 3D glasses lying around from my Toy Story Mania! game, it’s easy for me to see the 3D object using the color anaglyph. If you’re able to see stereograms, then this option is the best for you because you can see the image without color distortion from the 3D glasses. 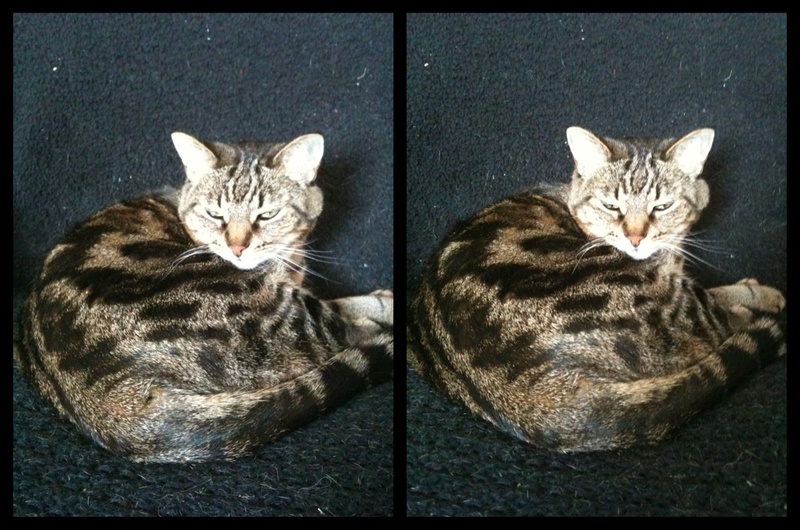 Note: view this stereogram by crossing your eyes. It’s a lot more difficult to get humans or animals with the 3D Camera, however. If they move, even a little bit, it will screw up the photo. 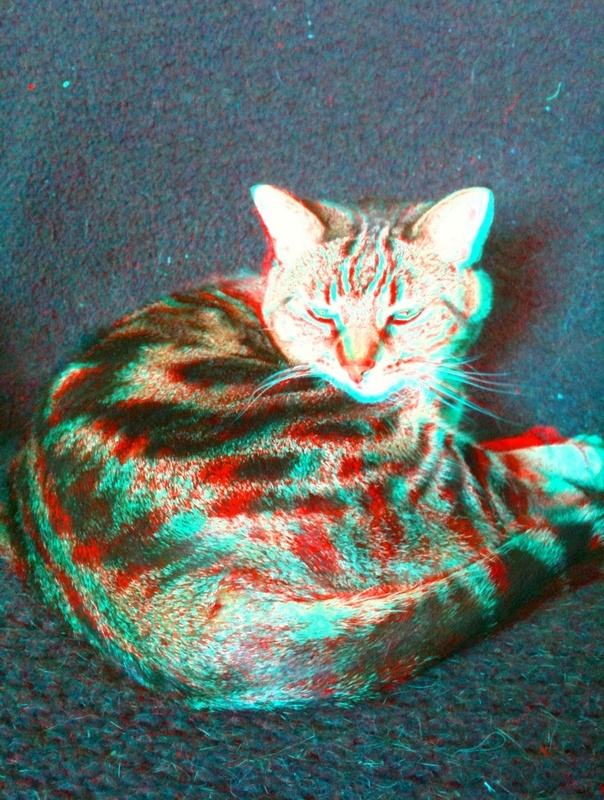 Since Maggie was being stone still, I was able to get a pretty good 3D picture of her here. If you look at the stereogram, however, you’ll notice that in one photo her eyes are more open than in the other, which creates a weird effect in the 3D photo. Note: view this stereogram by crossing your eyes. The Wigglegram makes that weirdness looks like she’s blinking. Ansel Adams took MANY stereogram photographs over the course of his career. I wonder if he had to do it like this or if he had a camera like the Revere 33. I absolutely LOVE 3D Camera. It makes me feel a little bit like Ansel Adams. 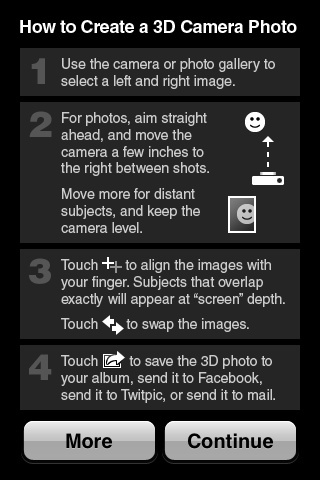 I originally bought the 3D Camera app when it first came out and they have since made taking the photos MUCH easier. It’s a great application for the iPhone and almost as good as the Revere 33 Stereo Camera!